LEXINGTON, Ky. Kentucky's athletic sanctioning body has ordered high schools not to conduct postgame handshakes in all sports following more than two dozen physical confrontations the past three years. Tuesday's directive from Kentucky High School Athletic Association Commissioner Julian Tackett posted on its web site didn't mention specific fights or conflicts but said several fall sports have had postgame incidents. The organization says it's "disappointing" to take such action but that it became necessary because of occurrences statewide and nationally. KHSAA has also instructed game officials to immediately leave facilities after contests or risk being penalized. Teams can choose to ignore the order. 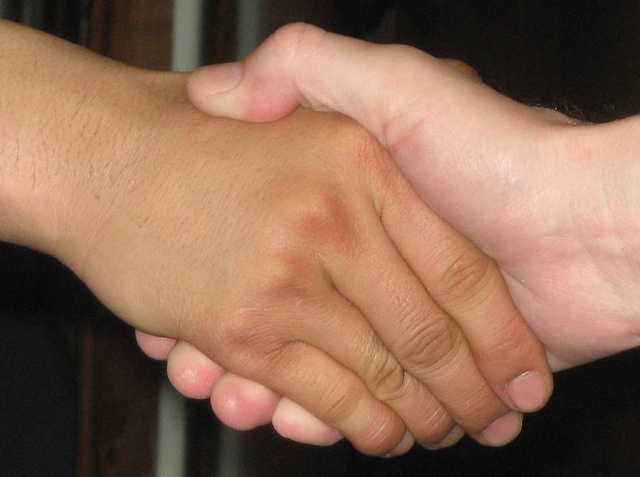 Schools that can conduct handshakes must supervise the activity and report any incidents to KHSAA. Member schools or coaches that engage in unsportsmanlike behavior will be fined and penalized. "It stops short of being a rule but it says that if you choose to do it, you'd better be able to manage it," Tackett said Tuesday evening. "There's no penalty for doing it, but If you don't do it right, you're going to held accountable." The commissioner said all sports have had problems over the years but cited a fight between volleyball players this fall as one example of what's happening. With the state football playoffs just around the corner and the possibility of players shaking hands after an emotionally-charged elimination game, the directive was implemented to make schools take responsibility for conduct or not performing a ritual of sportsmanship. "If you have 75 players shaking hands," Tackett said, "you'd better watch what's going on."